On rare non-specific recombination, the viral genome can be integrated in host chromosome. This inactivates the integrated virus but can gives the host cell a replicative advantage sometimes leading to hepatocarcinoma. The minichromosome is transcribed by cellular RNA polymerase II under the control of three to four promoters (the core, pre-S1, pre-S2/S promoters, and the X promoter in mammalian viruses) and two enhancer regions (ENH1 and ENH2). The pre-genomic RNA is alternatively spliced. The unspliced form is exported from the nucleus through a PRE motif possibly by capsid protein. The Polymerase and short S proteins are expressed by leaky scanning from the pg mRNA and the S mRNA respectively. 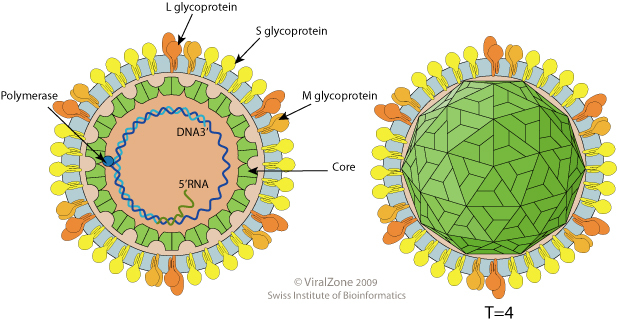 Transcription by RNA polymerase II of the pregenomic RNA (pgRNA) and subgenomic mRNAs, inducing synthesis of all the viral proteins. pgRNA is encapsidated, together with the P protein, and reverse-transcribed inside the nucleocapsid in (-)DNA covalently linked to P protein. (+)DNA synthesis from the (-)DNA template generates new RC-DNA. HBV protein HBx seems to be able to increase autophagy through the up-regulation of host beclin 1 expression . HBV protein HBx protein deregulates cell cycle checkpoint controls at G0/G1 and G2/M . 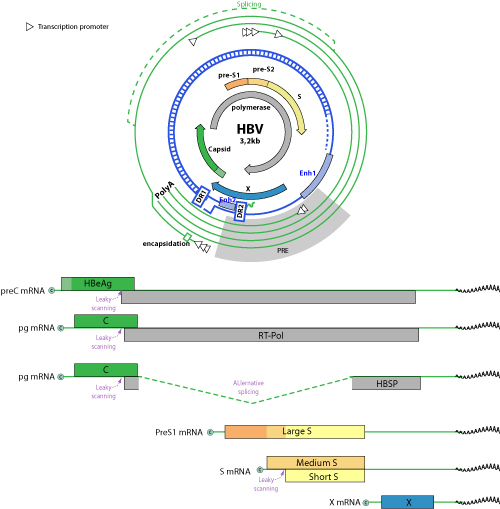 HBV protein HBx directly interacts with and inhibits host MAVS protein by inducing its ubiquitination and targeting it for degradation .